Are Proxy Armies Coming to America? When we think of proxy armies and the arming of civilians we think mostly of the US government meddling in other countries particularly in the Middle East. We also think of (the late) Zbigniew Brzezinski arming the Mujahideen fighters in Afghanistan in the late 1970's and we think of the Bush-Obama years and the creation, funding, training and arming of fighters which would all turn out to have the same agenda and enemies as ISIS. 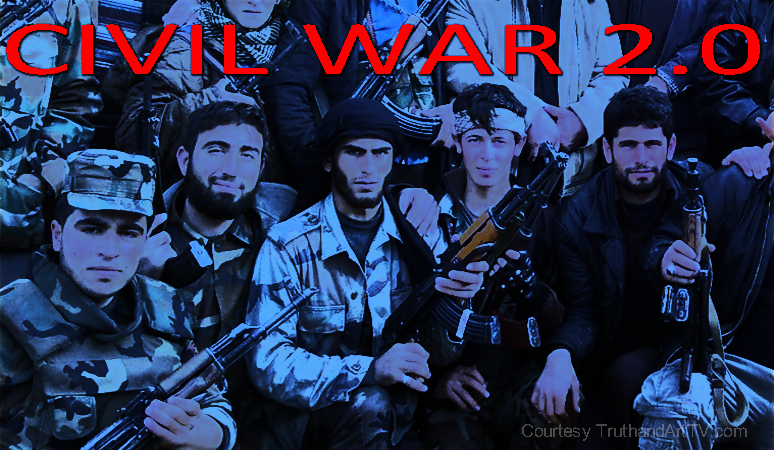 For anyone keeping track of the current deep state war this is a heads up warning of things that appear to be on the horizon in America as the road to Civil War 2.0 moves closer to reality. The Associated Press just put out a story that circulated within the corporate mainstream media which portrayed militias as the good guys and empathized with them. I believe this is a major red flag because this is something the corporate mainstream media especially the Liberal Left mainstream media never does. In fact for years, especially during the Obama years we've seen militia members portrayed as domestic terrorists by the Left. Armed groups which stands for America and the Constitution have always been a threat to the Liberal Left because this is opposed to the global order they want. I'm reminded how the corporate mainstream media demonized the Cliven Bundy family and the Bundy Ranch supporters as "domestic terrorists". From Oklahoma City bombing and Timothy McVeigh all the way to the Oregon standoff with Ammon Bundy and LaVoy Finicum, those associating with or said to have associated with the "militia" have not fared well in the eyes of the mainstream media. So naturally we should look to this recent very rare positive portrayal of the militia by the mainstream media with extremely high suspicion. As I describe in the video below, when the Liberal mainstream media who hates Trump so much and is determined to bring down America starts to speak positively about the militia and begins to describe situations in which the militias will be needed this is cause for suspicion and concern that there is a much deeper agenda going on here than meets the eye.